The Form Gallery, Issue #063 - "How to Get Church Visitor Contact Information"
I hope everyone is having a blessed summer so far. I have great information on "How to Get Church Visitor Contact Information", and I'm giving away some beautiful Church Visitor Cards (pictured to the right) that you can download, customize and print for your church visitors. I also have a beautiful Certificate of Appreciation for Worship Leader(s) free along with Any Event Thank You Cards to download and print along with much more. Shepherdbase Special - Are you finding yourself overwhelmed in the office? Shepherdbase will save you a lot of time in your church office. Shepherdbase - Church Membership Database will track memberships (unlimited), contributions, attendance and much more On Sale Now Through July 31st, 2013 for ONLY $29.99 so Hurry & Enjoy these Savings! 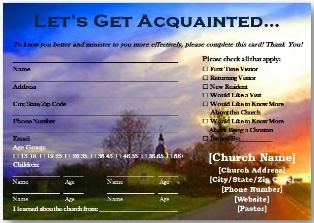 Do you have Church Visitor Cards for your church visitors to fill out? If not then you can access the free Church Visitor Cards at the end of this article. Ensure Visitor Cards Have Enough Information But Not Too Much - Make sure your Visitor Cards have at least the visitor's name, address, phone and email along with their children's name and ages. You also need to include questions that they can simply check off on if they are a First-Time Visitor, Returning Visitor, New Resident, Would like a Visit, Would Like to Know More about this Church, Would like to More About Being a Christian, etc. Then, most importantly, include your Church Name, Address, Phone, Website and Pastor's Name. Welcome Your Church Visitors First - All church visitors should be welcomed personally to make them feel at home before they are handed the Church Visitor Card. At that time, you should give them other information about your church if available. Ask Visitors to Fill Out Card & Reward Them With a Gift in Exchange For Visitor Card - It is even better if you have a "Guest Services Center" in your church so you can announce from the podium for the visitors to fill out their cards and let them know to take them to the "Guest Services Center" after the church service to exchange their card for a First-Time Visitor Gift. Once the guests gets to the center the Guest Service Worker will meet them, greet them and welcome them to the church. They will also inspect their card with them in front of them and help them with filling out their cards if they had any problems and then give them their complimentary gifts. If they left the email address blank you would nicely ask them if they had an email address, and if they said yes then you would nicely ask them if you could have it please. If they ask why then you can simply explain that this is so you can keep them updated on services, special service information, church events and more. Most people will give this information and some will not but that is ok too. Statistics show that 85% of visitors return if visited in 36 hours, 60% of visitors return if visited in 72 hours and 15% of visitors return if visited in 7 days. So follow up after they visit with a gift bag or something to thank them for visiting your church. Most churches consider themselves to be very friendly, but it is very important that your church dose their best to make sure that every visitor feels loved and welcomed. Click here for the Free Church Visitor Cards. Do you appreciate your worship leader(s)? If yes, then you might want to download and print this beautiful certificate to present to them to help show your appreciation. If you have had your worship leader(s) 1 or 30 years they still need to feel appreciated for their service to body of Christ. 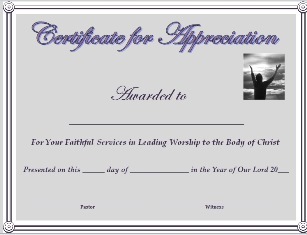 Click Here to download the Free Certificate of Appreciation for Worship Leader(s). Are you looking for some simple but awesome crafts for your Sunday School class for Labor Day? If yes, then download and print the Labor Day Crafts below. Don't you think every holiday deserves a craft of some sort from your Sunday School class or even for personally for your children at home? Most children, parents and teachers think so. 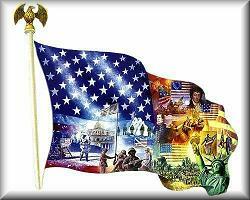 Click Here to download the Labor Day Sunday School Crafts. I will be continually adding new forms...so don't miss an issue! Shepherdbase (Church Membership Database) is On Sale Now Through July 31, 2013 for ONLY $29.99. You will also receive 2 Offering Envelope Templates and Offering Count Sheet free as a Bonus for purchasing Shepherdbase! Hurry and Enjoy these Savings! If you purchased Shepherdbase in the past (before Sept. 2011) and would like to receive the latest new updated version of "Shepherdbase" free of charge contact me. This great CD has all the free church forms, certificates, flyers...on FreeChurchForms.com along with 4 Bonuses as a Thank You for purchasing the CD all for one special price of $13.99 plus shipping and handling ($7.00 in the U.S. or $21.00 outside the U.S.). Free church forms, certificates, flyers...(600+ forms each in PDF and Microsoft Office Word format - some in Excel). Also continually updated to include the latest forms created. The Church Office Package includes Shepherdbase - Church Membership Database and the FCF (Free Church Forms) CD along with all the Free Bonuses for only $40.99 plus shipping and handling ($7.00 in U.S. or $21.00 outside the U.S.)! Hurry and Enjoy these Savings! This eBook is free to my newsletter subscribers as a special "Thank You" for subscribing to my newsletter. I have worked in several different secretarial areas with different jobs and I have learned the hard way how to organize more than one office. 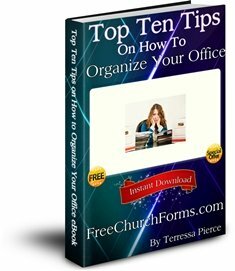 Take advantage of these tips in this free eBook and they will help get your office organized. Just click on the link below to download your free copy today. May God Richly Bless You & Your Ministry!